Study opens route to ultra-low-power microchips - AC INVESTMENT INC. Innovative approach to controlling magnetism could lead to next-generation memory and logic devices. A new approach to controlling magnetism in a microchip could open the doors to memory, computing, and sensing devices that consume drastically less power than existing versions. The approach could also overcome some of the inherent physical limitations that have been slowing progress in this area until now. Researchers at MIT and at Brookhaven National Laboratory have demonstrated that they can control the magnetic properties of a thin-film material simply by applying a small voltage. Changes in magnetic orientation made in this way remain in their new state without the need for any ongoing power, unlike today’s standard memory chips, the team has found. The new finding is being reported today in the journal Nature Materials, in a paper by Geoffrey Beach, a professor of materials science and engineering and co-director of the MIT Materials Research Laboratory; graduate student Aik Jun Tan; and eight others at MIT and Brookhaven. As silicon microchips draw closer to fundamental physical limits that could cap their ability to continue increasing their capabilities while decreasing their power consumption, researchers have been exploring a variety of new technologies that might get around these limits. One of the promising alternatives is an approach called spintronics, which makes use of a property of electrons called spin, instead of their electrical charge. 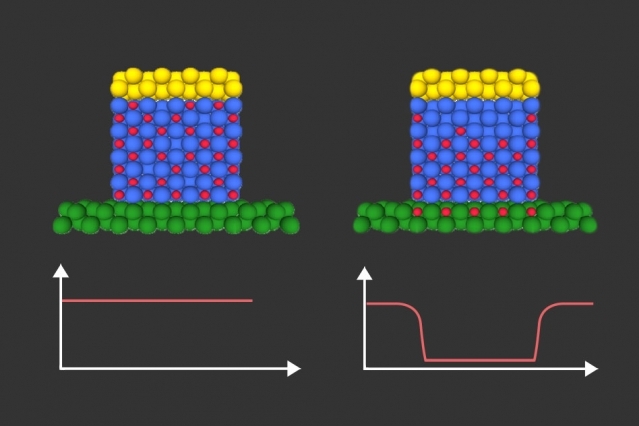 Because spintronic devices can retain their magnetic properties without the need for constant power, which silicon memory chips require, they need far less power to operate. They also generate far less heat — another major limiting factor for today’s devices. But spintronic technology suffers from its own limitations. One of the biggest missing ingredients has been a way to easily and rapidly control the magnetic properties of a material electrically, by applying a voltage. Many research groups around the world have been pursuing that challenge. Previous attempts have relied on electron accumulation at the interface between a metallic magnet and an insulator, using a device structure similar to a capacitor. The electrical charge can change the magnetic properties of the material, but only by a very small amount, making it impractical for use in real devices. There have also been attempts at using ions instead of electrons to change magnetic properties. For instance, oxygen ions have been used to oxidize a thin layer of magnetic material, causing a extremely large changes in magnetic properties. However, the insertion and removal of oxygen ions causes the material to swell and shrink, causing mechanical damage that limits the process to just a few repetitions — rendering it essentially useless for computational devices. The new finding demonstrates a way around that, by using hydrogen ions instead of the much larger oxygen ions used in previous attempts. Since the hydrogen ions can zip in and out very easily, the new system is much faster and provides other significant advantages, the researchers say. Because the hydrogen ions are so much smaller, they can enter and exit from the crystalline structure of the spintronic device, changing its magnetic orientation each time, without damaging the material. In fact, the team has now demonstrated that the process produces no degradation of the material after more than 2,000 cycles. And, unlike oxygen ions, hydrogen can easily pass through metal layers, which allows the team to control properties of layers deep in a device that couldn’t be controlled in any other way. “When you pump hydrogen toward the magnet, the magnetization rotates,” Tan says. “You can actually toggle the direction of the magnetization by 90 degrees by applying a voltage — and it’s fully reversible.” Since the orientation of the poles of the magnet is what is used to store information, this means it is possible to easily write and erase data “bits” in spintronic devices using this effect. Essentially, Beach explains, he and his team are “trying to make a magnetic analog of a transistor,” which can be turned on and off repeatedly without degrading its physical properties. The discovery came about, in part, through serendipity. While experimenting with layered magnetic materials in search of ways of changing their magnetic behavior, Tan found that the results of his experiments varied greatly from day to day for reasons that were not apparent. Eventually, by examining all the conditions during the different tests, he realized that the key difference was the humidity in the air: The experiment worked better on humid days compared to dry ones. The reason, he eventually realized, was that water molecules from the air were being split up into oxygen and hydrogen on the charged surface of the material, and while the oxygen escaped to the air, the hydrogen became ionized and was penetrating into the magnetic device — and changing its magnetism. The device the team has produced consists of a sandwich of several thin layers, including a layer of cobalt where the magnetic changes take place, sandwiched between layers of a metal such as palladium or platinum, and with an overlay of gadolinium oxide, and then a gold layer to connect to the driving electrical voltage. The magnetism gets switched with just a brief application of voltage and then stays put. Reversing it requires no power at all, just short-circuiting the device to connect its two sides electrically, whereas a conventional memory chip requires constant power to maintain its state. “Since you’re just applying a pulse, the power consumption can go way down,” Beach says. The new devices, with their low power consumption and high switching speed, could eventually be especially useful for devices such mobile computing, Beach says, but the work is still at an early stage and will require further development. “I can see lab-based prototypes within a few years or less,” he says. Making a full working memory cell is “quite complex” and might take longer, he says. The work was supported by the National Science Foundation through the Materials Research Science and Engineering Center (MRSEC) Program. About|Adem Çetinkaya Investment INC provides venture capital funding to bold new companies.Launched as A/C Investment in 2017, A/C is the venture capital arm of AC ADV Inc.A/C has $112 million under management with 42 investments A/C is headquartered in Cambridge, with offices in San Francisco, Boston, New York, Jersey and London.AC Investment INC currently does not act as an equities executing broker or route orders containing equities securities. If AC Invest’s business model were to change and it begins routing non-directed orders in NMS securities, it will comply with the disclosure requirement of Rule 606.